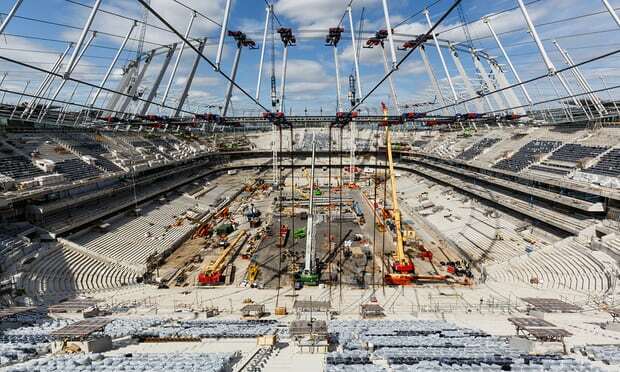 As Spurs continue to build their new municipal stadium, news is that the Premier League’s highest-placed London club’s victory over Southampton was watched by 33,012. Mauricio Pochettino, the Spurs manager, says: “We cannot ask more of our fans.” Not the ones that turn up, no. But surely the relatively small crowd in a cavernous Wembley Stadium is a worry for the Spurs moneymen. Last season, the same fixture on December 26 was witnessed by 57,297 fans. Spurs’ average attendance in the 2016/17 PL was 31,639. They then moved into Wembley. Spurs’ lowest league attendance in the 2017/18 season is the 50,034 that watched them take on West Ham United on January 4, 2018. Tottenham’s lowest Wembley attendance in 2017/18 was the 23,826 who saw them beat Barnsley 1-0 in the League Cup on 19 September, 2017. They don’t just come to see Spurs. It’s pretty fair to say the fans come to see who Spurs are playing. This season, the Spurs v Liverpool match was watched by 80,188 fans. But around half that number – 43,268 – saw the Lillywhites play Cardiff. When it comes to the Champions’ League, the identity of the visiting club is vital. On 3 October 2018 82,137 saw Spurs take on Barcelona. That figure dipped to 57,132 fo their must-win match with Inter Milan. The club’s new ground has a capacity of 62,062. There should be plenty of tickets available.